My bedside table is much like any other bedside table. It’s wooden, has two drawers, is home to a lamp and a coaster and a photo frame. There are a couple of books on top usually too, perhaps a notebook and pen as well. So far, so so. The floor beside the bedside table? Well, I’ll be honest, it’s a mess. 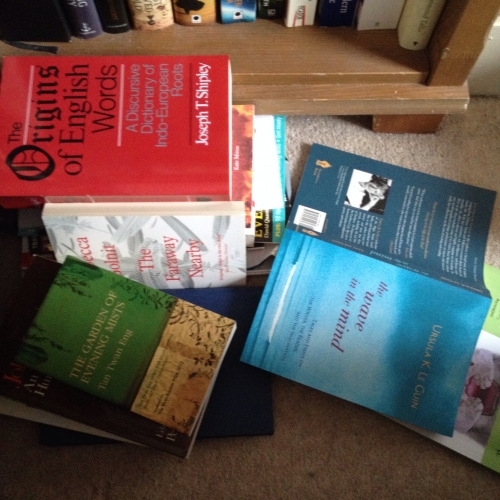 Since I’ve discovered that I’m incapable of keeping less than eight books beside the bed at any time I’ve also discovered that the room looks much neater if I pile them up on the floor rather than on the bedside table. It’s the mirage of housework. The downside is that sometimes it’s a bit precarious to physically get into bed, but I can always climb in from the other side. I’ve tried not to be messy. In many rooms, all over the house. I’ve tried putting the books back on the shelf as soon as I’ve read whatever it is that I pulled it out for. I’ve tried reading one book at a time. The problem is that the process, the thinking, still needs to be going on. And to keep it moving I need to see the physical evidence of the thoughts I’m trying to chase. The books I want to reference. The ideas I want to include. The shape of the work I am trying to make. If I put the books back, then the thoughts go back in too, and I have to dig twice as hard to get them out. It’s a surprise to find out how crucial the visual is. Over the summer we decided we should sell our flat and buy a house, and that meant I had to clear The Wall. I’d been sticking post it notes across the big white expanse of wall in the loft room where I worked, since we’d never got round to putting any pictures up. They were colour coded, for character, events and plot points, and formed a timeline from the beginning of the work to its end. I added printed maps and articles to the edges, stuck up hasty plot summaries in felt tip. If I wanted to feel I was making progress on a really bad day I just looked at The Wall, and the little cogs kept churning. But you can’t sell a house with a Wall. So I took everything down and put it in a drawer. And just like that, the work stopped. It took me a while to identify what had happened, because the days were also filled with a hitherto unknown level of dusting and cushion plumping, which distracted me from the more serious problem that the words were just not coming out anymore. My time for ‘doing’ is limited, and irregular. We all have this problem with the clock. So any hour that I spend trying to get back to where I was before is still a wasted hour. I need those little visual jolts to help me keep my place. I need to let the books lie around and push me into thinking, even if it’s just a little bit, every night before I go to sleep. I need to not tidy up. How is the house-selling going? Hope all is progressing well! Gawd, the cushion-plumping! That’s what nearly killed me when we were selling our house. A newly-plumped cushion seems to be an invitation for small children to take a running jump on to the settee. I used to make the three of them stand in the hall whilst I ran around plumping things prior to evacuating the house for viewings. I share your books everywhere problem. I really need to have them nearby, and have a similar thing with fabric. I was ever the girl with three books under my pillow, another couple slipped down the side of the bed, and a pile at my bedside. Whoever would read just one book at a time?